ENCINITAS, CA--(March 31, 2016) - DMV.ORG, the nation's largest independent resource for DMV-related information and services, today announced its first in-house Local Giveback event with the Monarch School, a K-12 public school dedicated to helping San Diego's homeless students break the cycle of poverty through education. Seventy-five students ages 11–14, from grades 6th through 8th, attended the event at the DMV.ORG offices in Encinitas, California on March 30, 2016. The day included seven Career Day-esque presentations from each DMV.ORG department about potential future jobs in the Internet space, plus the donation of a laptop to each of the three grades, and culminated with a catered meal at Moonlight Beach with the Monarch students, teachers, and DMV.ORG employees. DMV.ORG also announced its commitment to an additional event in 2016 with the Monarch School that will also focus solely on grades 6th through 8th, in a co-effort to concentrate on the needs of pre-teens and teenagers. Katie Bradel, Volunteer Coordinator at the Monarch School, said, “Monarch School believes that hard work should be celebrated. 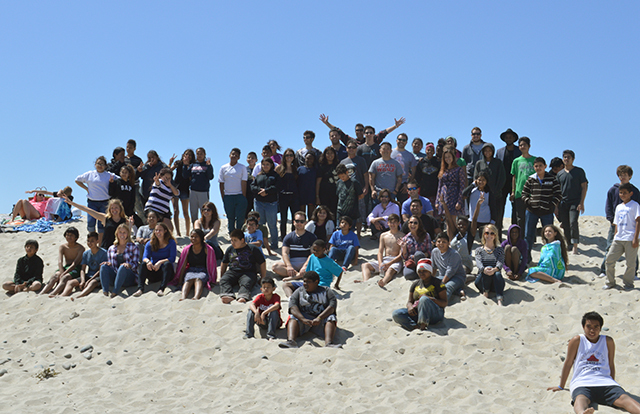 Thanks to the amazing team at DMV.ORG, our Junior High students got to spend a wonderful day at the beach meeting new friends, learning about the work done by DMV.ORG, and celebrating all of their hard work this trimester. We are so appreciative of the support!" Bob Kurilko, President & Chief Operating Officer at DMV.ORG, said, “We are pleased to be in the position to host the event with the Monarch School; what a great group of children." He continued, “We believe that sending a caring message to the next generation, a message that connects business and social responsibility, is both powerful and important in the world today. We care about these children, and there is no better way to show it than having our team directly engage with them." “We've been in a relationship with the Monarch School since September of 2014," Shiloh Boss, Director of Organizational Development, said. She added, “Our Local Giveback program is a highly valued aspect of our corporate culture and is a model for how companies of all sizes can make a positive impact in their local communities." To learn more about the Monarch School and how you can help the nearly 22,000 homeless students in San Diego County, visit http://monarchschools.org/. You can also learn more about DMV.ORG's Local Giveback at http://www.dmv.org/local-giveback.php. With over 170 million annual visitors, DMV.ORG is the nation's largest independent resource for DMV-related information, products, and services. Since 1999, DMV.ORG has organized, simplified, and worked to redefine vehicle drivers' relationship with the complex world of the DMV and motor vehicle compliance. With driver's tests, form libraries, insurance, registration, DMV office finders, and industry-leading partner services, the company's digital publishing house empowers drivers with what they need to reduce their time in line at their state agency and free up more time in their lives. DMV.ORG is a privately-owned digital publishing house located in Encinitas, California. Learn more: www.dmv.org.